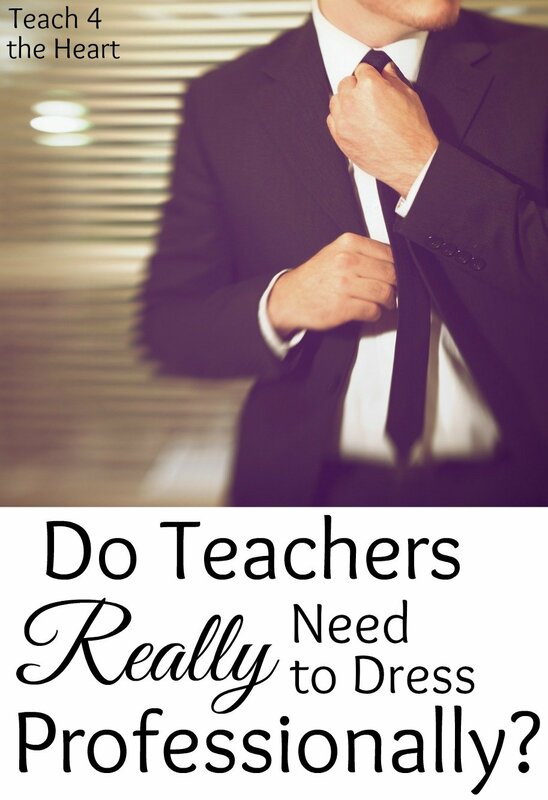 >> Do Teachers Really Need to Dress Professionally? Hmmmm….good question. If you ask some people, the answer is an emphatic yes. But if you look at some very successful teachers, you might think the answer is not necessarily. So does it matter what we wear as teachers? Should we focus on comfort and easy-of-movement or should we put forth the effort to dress professionally? While I do think that it’s wise to err on the side of being more professional, I’ve come to realize that the real answer is this: it depends. For some teachers in some situations, dressing professionally may be the difference between success and utter failure. But for others, the difference it makes is practically nonexistent. Now, a slight disclaimer, I firmly believe every teacher should look nice and of course dress modestly. We all need to be good examples to our students and we certainly shouldn’t be distracting with our wardrobe (unless it’s spirit week, of course.) But the question here is whether or not we need to bust out the suits and blazers every day. Ladies, do we need a drawer full of pantyhose? Or are khaki capris and a semi-casual top occasionally acceptable? Once again – it depends. When Do Teachers Need to Dress Professionally? I see the need to dress professionally on a bit of a sliding scale. There are multiple factors that affect this, so you can’t necessarily just look at the other teachers in you school and do exactly what they do. The younger you are. When I was fresh out of college, it didn’t matter what the veteran teachers at my school were wearing. I was young. Really young. And I needed to look like a teacher. Apparently I needed my dress to be a distinction because whenever we had dress down days parents kept thinking I was a student. The less you’ve been teaching. That first year, professional dress can be pretty important – both in how you portray yourself to your students and in the confidence it gives you. Once you’ve been teaching for twenty years – well, it’s probably a little less critical. The earlier it is in the school year. Even if you’re a seasoned veteran in your mid-fifties who has it all together, the first day of school brings new students who don’t know you. At all. So dressing professionally at the start of school is always a plus. First impressions are still important. The older your students are. If you’re teaching preschool, your students will not be paying much attention to your dress. Okay, they probably will love your necklaces, but they won’t really care if you’re dressing professionally. On the other hand, if you teach high school (or even middle school) then dress starts to matter much more, especially if you’re somewhat close in age to them. The more parents are involved. It doesn’t matter how old you or your students are, when you meet with parents, you want them to see you as a competent professional. So when it’s time for parent-teacher conferences, orientation, or open house, you should probably step up the professionalism of your dress by a notch or two. The less you have a natural air of authority. Some people exude authority. Just looking at them, the students start shaking in their boots. That is not me. I am petite, young, and naturally soft-spoken. I have to develop my authority through other means – and professional dress is certainly one of them. The more formal your school is. Finally, the culture of your school is a big factor. In some schools, acceptable dress for the men is nothing short of a suit and tie. At others, wearing a button-down shirt makes you seem uber-professional. Take this into account, but remember that it’s definitely not the only factor to consider. When I started teaching, I was new, young, my students were semi-older (middle school), and I did not carry much natural authority in my look and demeanor. So my default was professional dress, especially at the start of the year and most certainly during my first year. So if you’re like me – new, young, and maybe even lacking a bit of confidence – get shopping and find yourself some professional clothes. 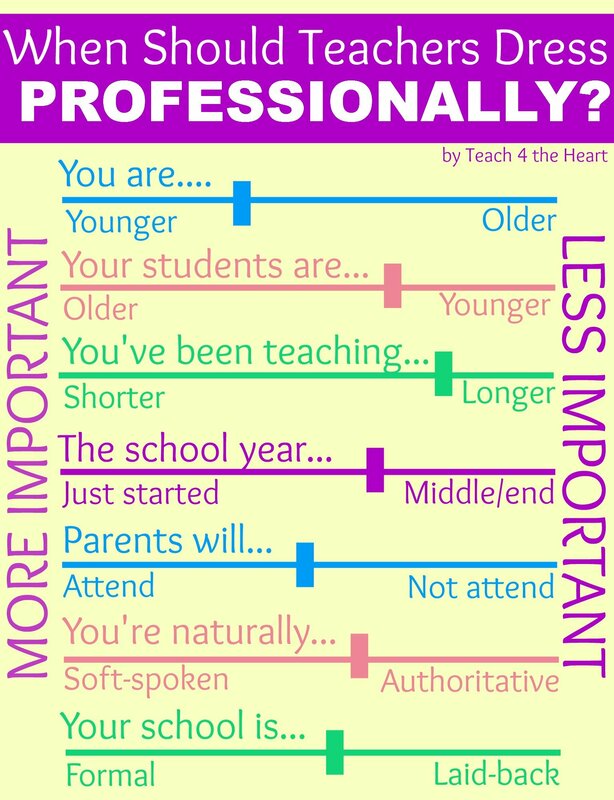 And be sure to check out the next post: How to Dress Professionally on a Teacher’s Income. So what about you – where do you fall on the spectrum? How much effort do you put into dressing professionally? Share your thoughts with a comment below. Hi, I loved reading this article! I will be starting my first year of teaching this September and like you I am young, petite with a naturally soft spoken voice. On top of all that I will be working in High School, where my students are almost always larger than me. Through my teaching practice experience I have come to realize that the way I dress has a significant impact on how my students view and respect me. I definitely will be viewing your other articles! Thank you. Well done! I totally agree with the whole analysis. I am a veteran teacher and have gone through all of the phases listed. Judgement is always important. I dress appropriately for our activities as well, if we are taking a nature walk, I keep that in mind. By attaching all of these meanings to the way we as teachers dress, we are modeling to our students that it is acceptable to judge another human being by the clothes they wear. I’m not on board with that idea. It may not be what we want the world to be like…but the reality is that people are judged by the way they appear. It is human nature. That being said, one must instill in students that what is inside is the most important thing and that you must take care of the outside so others will want to know more about who you are as a person. Are you okay with your doctor coming into the office in hunting gear? I used to be on the side of it didn’t matter how I dressed. I have now taught for a school that requires a little bit more on the side of professional dress, and I can say it has really made a difference for me. When I look good, I feel good. It gives me confidence, especially during a tough meeting with a parent. In my jeans and polo, I just don’t feel as respectable as when I am in a great skirt and blouse. I still love our dress-down days, but I am thankful for the requirement to step it up a bit on most days. I feel I get a lot more accomplished throughout my day if I am comfortable. I have a lot more motivation on our jean days, or weeks, and that motivation/feeling of comfort can be seen through my teaching. Clothes should not make a difference in the way a person sees you as a professional. I’m not in the teaching profession to impress parents with my clothes, I’m in the teaching profession to help teach their students. I think it also depends on what branch of education you’re in. I teach self-contained special education in the upper-elementary grades, and I’m having to deal with temper tantrums, aggressive behaviors, changing diapers, feeding, cleaning up various body fluids, and carrying/lifting students of varying weights/mobility levels. There is practically no room for professional dress in my line of work, and I don’t know anyone in my school district who teaches in a similar program and is required to break out the pant suits. It’s really not practical for us. I completely share your sentiment. I just made the switch from elementary severe Special Ed to General Ed and where I was frequently in leggings and tees or some other variation or workout attire. I am now essentially only wearing skirts and dresses. I would dress nicely on occasion, but that wasn’t the norm. I often dress a lot more professionally on the day that I also teach a college course. I am a pre k teacher and usually go for comfort and ease of getting up and down on the floor.Staff and students often compliment me on those days. I am over 60 and have been teaching 24 years. I teach at a prek-2nd grade school. I teach primary self-contained special education and I frequently wear running shoes. I learned early on that is is not good to wear open toed shoes after a student accidentally stomped on my foot. I also learned that clothes that need dry cleaning are not a good idea after I had a nice outfit ruined by a student touching me with messy hands the second time I wore it. I frequently have at least one student who is a known runner and I need to be prepared to move fast. I never wear skirts and dresses! When I have an IEP meeting, I try to wear a nicer pants outfit but I still wear shoes I can run in! I teach high school students and always dress professionally but comfortably- usually a dress and flats. I had a student remark on an evaluation that she really respected me and took my class seriously because it was obvious to her that I was a true professional because I took the time to look professional and be prepared for class. Another mentioned that I inspired her to take more care in her own appearance because she wants to illicit the same kind of respect I got from my students. These comments and others I have received from students make me realize that care for my appearance helps to set a positive tone in my classroom. Yes I feel teachers should Dress in a professional manner. I don’t mean the suits, but they should Dress appropriately . It sets a certain standard In the classroom and among the staff. They should dress like they are going to work, no matter what the job is, and not like they are running to the grocery Store. Yes, children learn from what they live. If you dress as if school is not important and you can just throw on any old outfit….then don’t expect much more from your students. When they see you took the time to dress nice and treat the school day as if it is a special occasion…they will see it that way too. I am appalled at some of the outfits teachers come to school in. I wouldn’t wear some of their outfits to take my trash out…let alone show up for work! How embarrassing to the profession! I’ve been teaching for 4 years and I strongly feel teachers should dress up well. Like mentioned in the article above, students do notice what you wear; especially if they are older. In my case, my students remember the perfume I use and they can tell if I changed my fragrance. Dressing up well also gives the confidence a teacher needs. It just takes you to a different level and yes, your students will emulate you in every they can and this certainly includes the way you dress. I really enjoyed this article! I will be starting my student teaching and my university requires us up dress professionally. But some of the schools I’ve been in, they aren’t so strict with dress cod. I too, and petite short and soft spoken so i definitely feel the need for professional dress. Again, thanks so much for this article. Agreed! I have been teaching 7th grade for about three years now, and not only am I young, petite, and soft spoke, but I always have looked about five years younger than I actually am. Typically I’m a jeans and converse kind of girl, but in my classroom, I’ve noticed when in professional dress, the behavior and distractions are less of a problem. It’s a little thing that can make my day that much easier. Kids know it’s time to get down to business, and that we don’t have time for off task behavior in here. We write, we discuss, and we learn so much better! I’m the art teacher, so what represents professional dress for me is different from what is professional dress for a classroom teacher. I have an Einstein quote in my room. It goes something like, “Opportunity is missed by most people, because it’s dressed in overalls and looks like hard work.” It follows that I dress for the work I will be doing on that day. On some days that means overalls. There are a lot of professions in which dressing professionally means dressing for a hard day’s work, living the value of this kind of work is one of the ways in which I serve my children. Of course this might be easier for me than it might be for other teachers. I’m tall, 50+, and could probably stare down the Pope. Yes, every situation is different! I agree that how professionally you dress is important but it varies with exactly what your position is and what you are doing that day. I empathize with the girl who remarked that she had to wear running shoes, been there done that, and I remember when closed toed shoes were mandatory! My students taught me that professional dress makes a big difference! They always mention how nice i dress. And when I was substitute teaching in college, on a casual Friday a fifth grade class that I usually did very well with, was out of control. At line up, a girl told me straight out, “Miss Garcia you would a had a better day, if you dressed like you usually dress.” I never forgot that lesson. I do believe teachers should dress professionally. It is one of the few things left we have control of and since it is our chosen profession, we should dress like it is important to us. We are already treated like Cinderella, no need to dress like her. Until this society realizes a country is only as strong as its education system, we must dress in a way that portray competence, confidence, and yes, professionalism. Eme, I agree with you. We as teachers can only be taken seriously when we exhibit we are serious about our profession. I realize there are teaching positions in which a suit would not be appropriate, such as the art teacher or low level special education or even the welding instructor, but for the majority of classroom teachers, we should do better than leggings and t- shirts. A new teacher to our school last year was shocked to find out that jeans were not ok for everyday wear as in her previous school. We do not have a teacher dress code, but khakis and nice tops are considered fine. Most of us dress better than that on most days. If we were a lawyer or banker, would our clients expect certain dress? When people think of teachers, should a certain picture come to mind with respect to attire? I think so and it should fall in line with the bankers and lawyers. We are still role models to our students. We need to dress and act like we realize it. Our first day of high school we have a half day with the freshmen only reporting in the morning. We are asked to wear jeans/ comfortable clothes and a school t-shirt as we have to do some outside supervising. I would rather dress up a bit, but are told not to… What to do? Well, if you’re told to wear something specific there’s not a lot you can do. I’d just dress it up as much as I could…Then really dress professionally the next day. As a senior staff member in my school I get to mentor new teachers and teachers in training.. I am perturbed at the dress or lack thereof of many new teachers. I won’t even mention tattoos or body piercings. but clothing does make a person. There are many male teachers who come with three buttons open on their shirt and tight jeans. Some of the female teachers must think they are auditioning for a night club. I tell these teachers, “students have enough distractions they don’t need you adding to it.” If you feel you have to show off your body go to the beach. Let the school be a place students can concentrate on learning from you not about you. Linda, I appreciate your comments. As a Christian male veteran teacher (in my 23rd year teaching HS English), the way you present yourself to the students with your attire is key. I wear suit and tie daily (except for Fridays, then I’ll wear school color shirts since I’m also a coach). Students do notice! I occasionally have students approach me and compliment me on my clothing. Boys will even tell me they want to dress just like me when they grow up. One girl once asked me why I dress up every day; my answer was simply because I take pride in my job, and you (the students) are like my clients & it’s my way of showing respect for you. She glowed hearing that answer. Love this! I definitely lean towards dressing more professionally myself.